Court solidarity demonstration to support the last protester arrested at the NATO summit, charged with assaulting a police officer. There will be a short solidarity demonstration outside the court from 9:15am on Wednesday 4th of Feburary 2015. Anti-militarist and anti-police repression banners and well-wishers welcome. Afterwards some of us will be supporting the defendants from the public gallery. 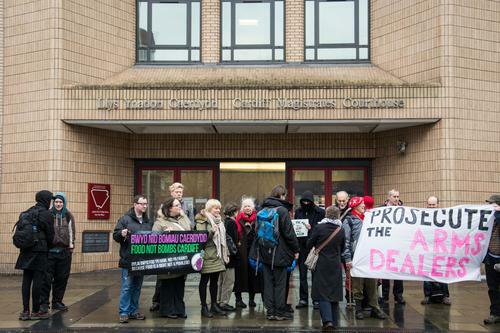 Two anti-militarist activists faced trial in Cardiff on 6th January 2015. They were potentially facing prison sentences having been accused of disrupting the DPRTE arms fair in October 2014 by damaging the luxury suits and shoes of three delegates with red childrens’ play paint. The prosecution was pushed through in three months, but collapsed after being ridiculed by the judge for its sloppiness. The research done in solidarity with the defendants – and the many groups and individuals who turned up to support on the day – have propelled a young but promising campaign. Started in 2012 and initially planned as an annual event, Defence, Procurement, Research, Technology, Exportability (DPRTE) is a military business and arms trade event that has been widely promoted by the MoD and the military community as ‘the UK’s leading defence event’ for businesses ‘to gain your share of £160 Bn from the MoD’s 10 Year Equipment Plan’ including £11.4 Bn on weapons, £18.5 Bn on combat air, and £35.8 Bn on submarines and nuclear weapons of mass destruction. The two first editions of DPRTE took place at the Exhibition and Conference Centre of the University of the West of England (UWE Bristol), whose main campus is literally stuck between the MoD’s Procurement Centre and a business park replete with arms dealers. In 2013, anti-militarist campaigners targeted this event for the first time, and staged a protest that caused the event to move to Cardiff Motorpoint Arena. However, on 8 October 2014, DPRTE 2014 was once again met with protests after groups including Stop NATO Cymru, Anarchist Action Network and South Wales Anarchists called to oppose it. The highlight of the day was when three delegates got their suits and shoes covered in washable red paint on their way in. Police immediately arrested two local activists for allegedly causing criminal damage to the delegates clothes. A video of these events has appeared on the web. On the 6th January 2015, the same two activists were on trial at Cardiff Magistrates Court. The day started with a solidarity demonstration in front of the court. Several groups came out to support, including Food not Bombs Cardiff, Anarchist Action Network, Afed Bristol, Cor Cochion Caerdydd, Bristol Defendant Solidarity, Bristol Against the Arms Trade, disarmUWE as well as South Wales Anarchists. As soon as the trial started, it became clear that the prosecutor had just been parachuted in and that he knew next to nothing about the three separate trials that had been scheduled for the day. Having realised that none of the arms dealers and organisers who had alleged criminal damage had bothered to show up, he tried to amend the charges on the spot to cover criminal damage not to the arms dealers’ luxury suits, but to police uniforms (via indirect paint transfer during the arrests). However, after calling such a swap of charges “ludicrous” and trying to help the prosecutor scrape together a case, the judge said that the CPS’s lack of preparation was a matter of “considerable consternation”. The morning was lost waiting for the prosecutor who shuttled back and forth between the court room and his witnesses (only policemen) lined up in the hall. When he finally returned to the court room, he had little to say to the judge anyway. The case was adjourned for lunch and on our return, we immediately learnt that the charges were dropped. Most of the ensuing debate focused on whether the judge would allow the refund of witnesses’ travel expenses (which he ultimately did), and overlooked the fact that the incompetent prosecution had probably wasted thousands of pounds of public money. This unexpected victory prevented the defendants from sharing new research gathered by their solidarity group. This ongoing research starts to offer an in-depth look into DPRTE, especially its role in facilitating military imports and exports, and its academic collaborations. The research also supported the legal case by exposing the role of DPRTE 2014 in the ongoing war waged by Israeli forces against Palestinians. Considerable credibility issues had also been identified with respect to aspects of the police evidence, not least from officer Neville Bradbury, who had previously been sanctioned for gross misconduct for “plying an under age and ’vulnerable’ suspect with cider before taking his confession for burglaries he didn’t commit“. Last but not least, we found out that Cardiff Motorpoint Arena hosts several arms dealers including Babcock Training and Education, Babcock International Group, and VT Group. Despite its self-congratulating statements, DPRTE seems to be only a partial success. Organisers struggled to achieve the level of corporate sponsorship they had hoped for at last years’ event. Moreover, initially planned as an annual event, the organisers have decided not to run it in 2015; the next DPRTE is planned for March 2016. This nascent campaign may already be at a turning point, shifting from reactive protests against DPRTE events, to pro-active interventions on our own terms against DPRTE and the various organisations that enable it. 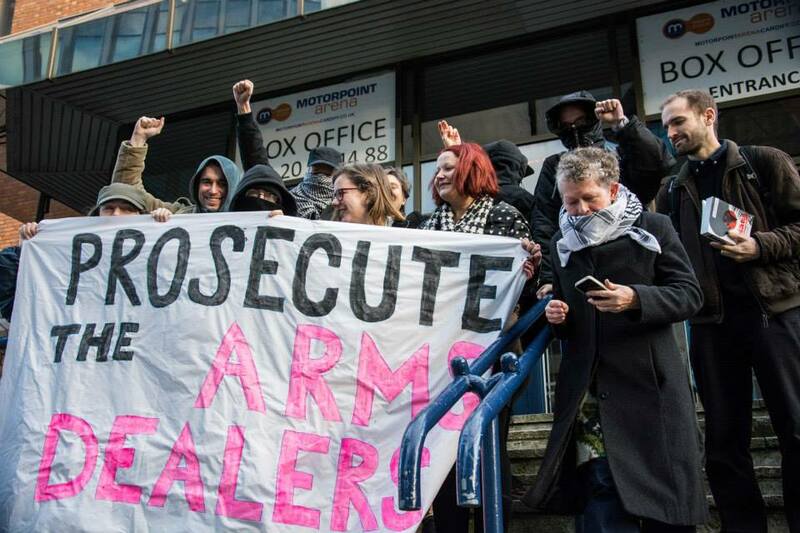 On the 6th of January 2015 two local people stood trial, accused of disrupting last year’s Defence Procurement, Research, Technology & Exportability (DPRTE) Arms Fair, now an regular occurrence in Cardiff. The defendants were accused of throwing red paint at delegates entering the fair, damaging their luxury goods worth hundreds of hundreds of pounds. However, on the day of the trial the prosecution collapsed entirely, resulting in a surprise victory as all charges were dropped. Full report on the SWA blog. Court solidarity demonstration to support two much-loved people who are facing excessively harsh charges for allegedly seeking to disrupt the DPRTE arms fair in Cardiff last year. They stand accused of damaging the luxury goods of arms dealers and organisers with childrens play paint. There will be a short solidarity demonstration outside the court from 9:15am on Monday 6th January 2015. Antimilitarist banners and well-wishers welcome. Afterwards some of us will be supporting the defendants from the public gallery. Stop NATO is part of a coalition of groups supporting this demo, which is on Fri 17th Oct, 1-3pm. Full details here. During July and August 2014, 2,150 Palestinians were killed as Israel carried out another massacre of Palestinians in the besieged Gaza strip. Entire neighbourhoods were destroyed. Mosques, market places, UN relief compounds and schools were deliberately targeted. There was no safe place for the 1.7 million people in Gaza to take shelter from the Israeli bombardment. Israeli unpiloted planes, known as drones, carried out over 800 major strikes. Elbit Systems, Israel’s largest military company, supplied many of the drones used by the Israeli military. Through its subsidiary UAV Engines, Elbit Systems operates a factory in Staffordshire. The company regularly exports military equipment to Israel. Elbit is also a part of the U-TACS partnership manufacturing the Watchkeeper drone for the Ministry of Defence. On the 8th of October Cardiff will host one of the UK’s biggest arms fairs at the Motorpoint Arena. Let’s show them what we think of their dirty business! South Wales Anarchists have called for people from south Wales and beyond to come and picket outside the arena that day from the time they open for registration at 8.30 am. Inspired by the recent Week of Action against the NATO Summit in Newport a group of local activists took control of an abandoned office block on Lower Dock St., secured the building and now announce their intention to launch a new social centre and creative space for the Newport community. The Newport Action Centre will host a weekly free vegan café, info-talks, various workshops, skill-shares and an art space, regular events to raise money for local causes, and a home for some of us who need it, to run the space from. All at NAC, 89 Lower Dock Street, Newport. On the second day of the NATO summit Stop NATO Cymru and Anarchist Action Network called for affinity groups to take action against NATO and militarism in whatever way they saw fit. At 3pm a group of about 40 people occupied the Barclays Bank in Newport High Street. Four people glued themselves inside the branch and the branch was shut for the rest of the day.